Due to the amount of questions we receive about golf cart tires and wheels, Golf Car Catalog has prepared an informative article to explain and answer many of the most common topics of discussion. Although, golf cart tires and wheels have much in common with their larger scale automotive cousins, there are also many attributes which are unique to the golf cart, utility vehicle, and low speed electric vehicle industries. Modern golf cart tires are tubeless and come in a wide variety of sizes and tread patterns. All tubeless golf cart tires have a thick ‘bead’ at the inner diameter of the tire on each side and air pressure pushes the bead against the wheel to form an air tight seal. Standard golf cart tires (factory) measure 18″ tall (outer diameter) x 8.5″ wide (across the tread) x 8″ at the bead (inner diameter). It is written 18 x 8.5 x 8 where the first number is the overall diameter of the golf car tire, the second is the width at the tread and the third is the diameter of the golf cart wheel. Please see illustration at left. On golf cart tires, the designation ‘NHS’ means Non Highway Service. This generally follows the tires size discussed above. 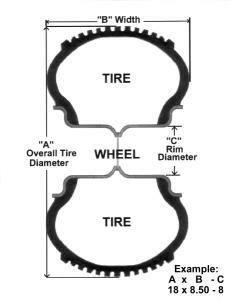 The rating means the tire cannot stand the pressures created by high loads and/or high speed rotation. They work fine for golf carts, but if you’re planning on going really fast, you might want to consider a ‘B’ or ‘C’ rated highway tire. They have more plies (layers) and better rubber to withstand the punishment of high speed road use. See below. Your golf cart’s tire pressure is critical to long tire life. Proper tire pressure is usually indicated on the sidewall and will vary between brands or models of golf cart tires. Most golf car tires use somewhere between 15 to 25 PSI (pounds per square inch) with an average of about 20-22 PSI. Many off-road tires may use as little air pressure as 12-15 PSI for added traction. Keep in mind that the greater the tire pressure, the easier the golf cart will roll, but the ride becomes stiffer and the center of the tire may wear prematurely. Too much air will also reduce your traction as only the middle of the golf cart tire makes sufficient contact with the ground. Lower air pressure provides a smoother ride and provides more traction, but also takes more power to turn the wheels. If you go too low, then the outer edges of the tire may wear prematurely. You may need to modify your golf cart’s tire pressure from the manufacturer’s specifications to best meet your specific needs for your golf car. Golf cart tire tread patterns vary from smooth (no tread at all) for greens mowers to straight rib and sawtooth for golf, turf, and street, to every type of knobby imaginable for off-road, mud, sand, and lifted application. 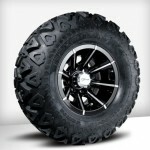 We carry a full line of golf cart tires in our online store for golf/street use and for all types of off-road terrain. Here are a few of the common tread types used in the smaller 18-20” sizes. Some golf car tires use a directional tread, such as the Mud Buster, Stryker or Swamp Fox. Be careful to mount your tires properly and place them on the correct side of the golf cart, so that the tread rotates forward. These golf cart tires provide great traction and, if mounted properly, will channel mud and dirt to the rear outside of the tire and help to keep the tread clean from debris. Sand tires are very different from most normal tread patterns. Generally, sand tires look like they literally have ‘paddles’. Sand reacts very differently from hard terrain conditions. Since sand has a tendency to move and slide, the paddles are designed to provide maximum traction under these conditions. Knobby tires are produced in literally hundreds of different tread patterns. Most have only slight differences in the shape of each knob or lugs. These slight differences in knob shape are designed to help each knobby perform effectively under specific conditions or terrain. Although some knobbies are very specific to terrain types (mud), many are very accommodating to various terrains and conditions. All terrain tires represent the best of all worlds. Typically, they have adequate tread to handle mild off-road use, while at the same time are not as aggressive as the other mentioned above. They are much more “yard friendly” than the others. Please check out the tread pattern examples below. Golf cart wheels are designed for low speeds and should not be used for high speed highway travel. If you need trailer tires or plan to make your golf car go fast, be sure to use DOT (Dept. Of Transportation) approved wheels on which to mount your highway tires. Just like the golf car tire, the golf car wheel cannot sustain the stress of high speed rotation under heavy loads. Golf cart wheels are generally produced in two mounting styles for golf cart purposes – center mount and negative offset. 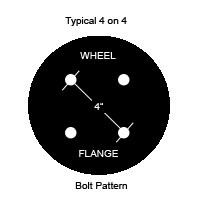 The differences between the two styles are based on the position of the mounting flange (center of the wheel where the lug bolts go through). Center mount wheels have the mounting flange located directly in the middle of the wheel width, when measuring side to side. Center mount wheels are standard factory wheels for most golf cart manufacturers. Negative offset golf cart wheels have the mounting flange positioned off-center towards the golf cart. 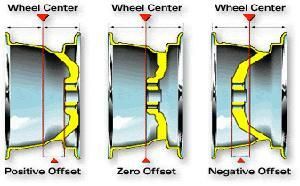 Instead of the mounting flange having an even distance from it to the bead seat on each side, the negative offset wheel generally moves the mounting flange an inch or two inwards. If you plan to turn your golf cart into a monster off-road vehicle by adding one of our great lift kits and oversized tire packages, you’ll need to invest in some negative offset golf cart wheels to prevent any rubbing or stability problems. We generally recommend using a 22 x 11.00 x 10 off-road knobby type tire on a negative offset 10″ golf cart wheel for most lift kit applications, although you can get as large as you like (at your own risk, of course). Be aware that these modifications will raise the center of gravity of your golf car and increase your chances of rolling or flipping. Hopefully, you’ve enjoyed out tutorial on golf cart tires and wheels. As time allows, we’ll publish more tutorials, as well as expand on topics such as this further. This entry was posted in Tutorials and tagged center mount wheels, DOT tires, golf cart tires and wheels, offset wheels, tire pressure, tire sizes, tread patterns, wheel sizes by Michael Williams. Bookmark the permalink. This is a very useful website and I’ve learned a bunch. Currently, I’m waiting on delivery of a RXV cart and am planning of buying a number of parts from you based simply on the knowledge your site has provided me. Thanks for the great resource. A 215 x 35 -12 tire has a tread width of 215 mm (8.46 in.). If you multiply the tread width by the next number as percentage (35%), you get 2.96. This number is the amount of sidewall on the tire. Since you have that amount of sidewall both above and below the wheel, you multiply that number by 2, which would be 5.92 (2.96 x 2). You then add that number to the diameter of the wheel which is 12 inches. This tire would have a tread with of 215 mm (8.46 in. ), would be mounted on a 12 inch wheel, and the mounted inflated height should be around 17.92 inches (455.17 mm) . A 213 x 40 -12 tire has a tread width of 213 mm (8.39 in. )/ If you multiply the tread width by the next number as a percentage (40%), you get 3.36. This number is the amount of sidewall on the tire. Since you have that amount of sidewall both above and below the wheel, you multiply that number by 2, which would be 6.72 (3.36 x 2). You then add that number to the diameter of the wheel which is 12 inches. This tire would have a tread width of 213 mm (8.39 in. ), would be mounted on a 12 inch wheel, and the mounted inflated height should be around 18.72 inches (475.49). So, the short answer is yes, the 213 x 40 -12 tire may work to replace a 215 x 35 -12 tire, IF you have a bit of extra height to spare in the wheel well. The 213 x 40 – 12 tire is slightly more narrow, which is not an issue, and mounts onto a 12 inch wheel as well, but it is about 0.80 inches taller (20.32 mm).